Deputy U.S. Marshal Timothy Dillion has had a terrible two years. First one, then a second love dies of a bullet wound in his arms. He is broken and afraid to love again for fear of causing another woman to die. Imagine his surprise when traveling with Marshal Nathan Ryder, aka: The Preacher, he ends up in Cottonwood chasing an outlaw from his past. One who caused the death of his first love. Add to that he's tasked with protecting Nell Shaw, the towns only nurse and a beautiful woman in her own right, from Dales attacks. Nell Shaw doesn't need a man. Nell hasn't felt safe with a man since the night she ran away from her fathers advances. She has been living with Aggie Cuttler, Nathan's aunt, since she was fifteen. 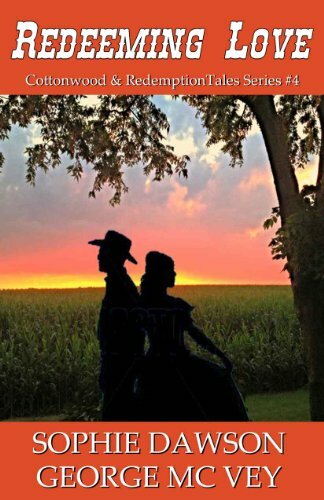 Now in the course of a few months she is kidnapped by Diamond Dale, forced to let the young and handsome deputy be her constant shadow, and had to deal with the return of her fatally ill father. She is drawn to Tim but doesn't want to belong to any man. Can these two overcome their separate pasts to find happiness with each other? Can Nathan Ryder and his wife find the healing they need from the betrayal they suffered in Redemption? Will Aggie finally get to take her knife to Leonard Shaw like she wanted to when he came to claim Nell the first time? Or is there healing in the Redeeming Love of Christ?